On Saturday, Dec. 15, Marist School hosted the 12th Annual MJB Invitational Meet of Champions at the Georgia Tech pool with 30 high schools in attendance. The sole representative from Pace was sophomore diver Lizzy Kaye. In a field of over 40 girls, Kaye won first place, turning in an All-American consideration performance and a new Pace 11-dive record of 511.75 points! The AquaKnights will be back in the pool in January. Check the schedule and come out to support the great team. 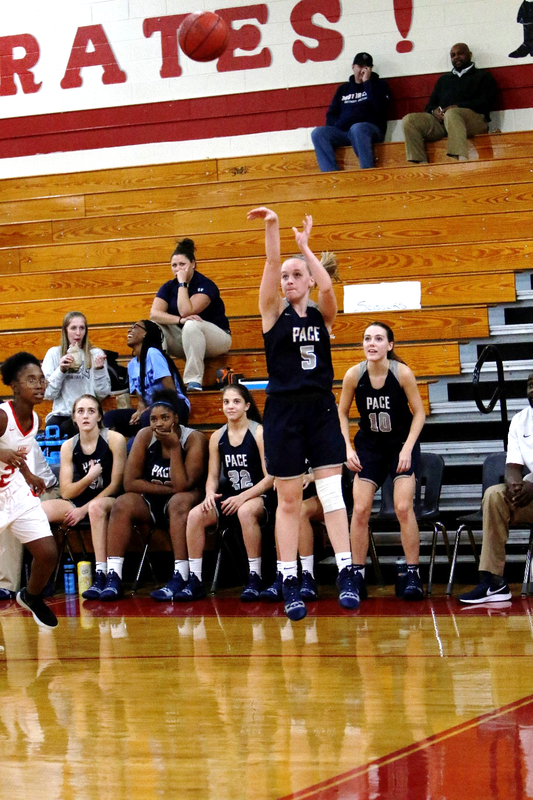 The varsity girls basketball team played two games on the road last week, starting with a matchup against the Stone Mountain Pirates on Tuesday, Dec. 11. At the end of the first quarter, Pace trailed 18-15. To start the second quarter, senior Paige Fleming provided a huge lift, knocking down two three-pointers while finding her teammates in transition and generating a much-needed offensive spark. The Knights went into halftime with a 7-point lead and never looked back. Senior Joelle Zelony found her stride, scoring 12 of her game-high 18 points in the fourth quarter. Zelony also had seven rebounds and four assists. Once again, the scoring was balanced, with three players in double figures. Senior Ann Rafeedie finished with 11 points and five assists; senior Kayla Ross had an impressive all-around performance with 11 points, eight rebounds, two steals and three blocks. Junior Virginia Hobbs and Fleming both finished with 8 points. Hobbs led the way on the glass with 13 total rebounds while dishing out four assists. Pace finished the game on top, 58-46. On Friday, Dec. 14, the Knights traveled down West Paces Ferry to take on neighborhood rival Westminster. 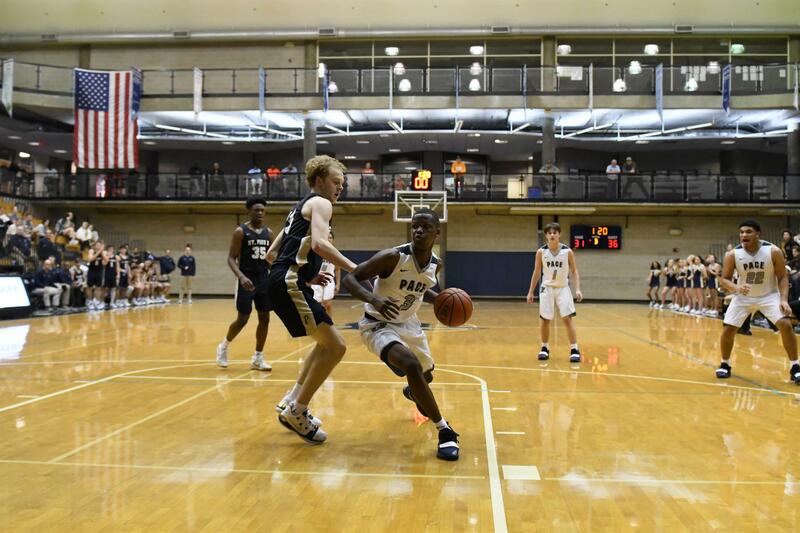 Pace set the tone early in the first quarter, applying ball pressure, setting traps and forcing turnovers that led to easy baskets in transition. Junior Jordan Upchurch knocked down three three-pointers in the second quarter, while sophomore Camryn Jones, Fleming, Rafeedie, Zelony and Ross all chipped in buckets, contributing to an impressive 21-point second quarter. The defense continued to dominate, allowing only two Westminster points in the third quarter. Junior Taylor Doucet, Ross, Hobbs and Rafeedie kept the offense going, while Zelony controlled the tempo of the game, facilitating and creating open looks for her teammates. Zelony tallied six assists along with five rebounds and five steals. Rafeedie led all scorers with 14. Ross and Upchurch both finished with 11 points. The Knights travel to Orlando on Dec. 26 to compete in the 31st annual Jim Clark Holiday Classic at Bishop Moore High School. The Knights begin the tournament with a tough matchup against Bolles High School, a perennial powerhouse from Jacksonville, Fla. The next home game is Saturday, Jan. 12, at 3:30 p.m. versus Lovett, the defending region champions. Currently, Lovett and Pace are both undefeated in the region. This past week the varsity boys basketball team faced two region opponents, McNair and Westminster, and played a strong Woodward team. On Tuesday, Dec. 11, the Knights went on the road to play Stone Mountain in a highly-contested game and pulled out a 49-48 overtime win. The Knights were led in scoring and rebounding by sophomore Cole Middleton, who poured in 16 points and grabbed 12 rebounds. Sophomore Madison Durr also contributed to the scoring effort, putting in 10 points and grabbing seven boards. On Friday, Dec. 14, the Knights drove down West Paces Ferry to face Westminster in front of a raucous home crowd. In the end, the Knights were victorious, 40-34. The team received a strong effort from sophomore point guard Josh Mininberg, who scored 8 points and was strong from the foul line, sinking six of eight free throws. Middleton also had a solid outing, finishing with a double-double of 11 points and 10 rebounds. The Knights' final game of the week took place at Norcross High School on Saturday, Dec. 15, where they faced Woodward Academy. The Knights had a solid game all around, but especially in the fourth quarter, when they went 5-5 from the field and finished the game at 81 percent from the free throw line. Middleton had an extremely impressive outing, finishing with his second double-double of the week, scoring 18 points and snatching 18 rebounds. Durr contributed to the victory with 13 points and four rebounds, going 7-7 from the foul line. Junior George Adams scored 7 points in 11 minutes off the bench. The Knights will have a busy winter break, starting with the War Eagle Classic, which takes place at Woodward Academy Dec. 21-22.